Access to WAVMA publications, peer-reviewed and other publications is provided as a service to assist WAVMA Members keep informed on numerous issues. Read exciting information about WAVMA's members and WAVMA programs and activities, meetings and jobs, veterinary student programs and scholarships, along with abstracts of clinically important publications, peer-reviewed articles, and lots more. The most recent issues are accessible to members only. Past issues of The Aquatic Veterinarian (previously Aquatic Vet News) are archived and available to anyone. 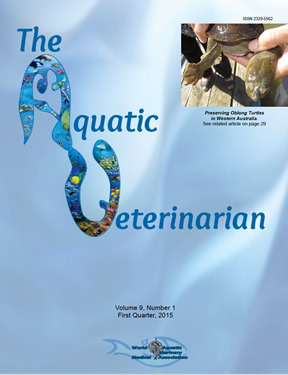 For more information on The Aquatic Veterinarian, and how to subscribe, advertize, or contribute an article for publication click here. See current and past issues of WAVMA e-News by clicking here.